In addition to the multiple ways of sorting the images that are available on the Posters page, Collections features clusters of propaganda posters that might otherwise get overlooked. Visually speaking, memory verse posters are the least interesting. 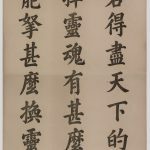 The calligraphy may occasionally warrant notice, but none of these prints are enlivened by pictures. Nonetheless, these posters are fascinating. They instruct readers in the foundations of the faith. What are the most essential concepts that must be "hidden in the heart"? If Christian teaching had to be reduced to twenty, or so, lines from the Bible, which ones should they be? 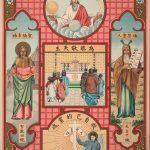 This collection of posters allow viewers to see what Chinese Christians prioritized during the Nanjing Decade (1927-1937). Roman Catholic posters differed significantly from those generated by Protestants. Whereas Protesants focused on evangelism, biblical stories, social issues, or creating decorations for a Christian home, Roman Catholics relied on posters entirely for one purpose. Catholic posters were catechetical tools. They instructed converts in the tenets of the faith.